The war between Israel and Hezbollah in 2006 came to an end when both conflict parties accepted the plan of reinforcing the United Nations Interim Force in Lebanon (UNIFIL) as a means to enable a ceasefire. In political as well as military terms, European nations were the driving force behind this UNIFIL ‘enhancement’ – marking a difficult return to the UN peacekeeping system since the debacles in the former Yugoslavia. This Egmont Paper explores both the political and military logic underlying the UNIFIL enhancement. On the basis of a detailed analysis of both the political decision-making process and the military planning cycle of the operation it develops two interlinked arguments. On the one hand, it argues that UNIFIL’s operational strategy relies on its threedimensional presence as a security buffer, as a mechanism for de-escalation and as an important actor in the local economy. On the other hand, it argues that friction between the political and military levels is at the root of persisting problems in terms of information management, organisational structures and the conceptual foundations of operational planning. As such this Egmont Paper assesses the strategic rationale of the operation, which is shown to be limited, and accounts for a variety of practical problems that hamper an effective functioning of the operation. On the basis of this twofold argument, three main conclusions can be drawn. Firstly, the enhancement of UNIFIL showed that the UN peacekeeping system still constitutes a suitable platform for deploying European armed forces, but under two specific conditions. On the one hand, the question under which organisational flag troops are deployed was answered on a pragmatic basis. The UN framework in this case was chosen because the host nation insisted on it. The Lebanese government excluded the other options, whether NATO, ESDP or an ad hoc multinational coalition. On the other hand, the European troop contributors insisted on redesigning the organisational set-up for the operation, both in terms of expanding oversight via the ad hoc established Strategic Military Cell as well as introducing their own approach to planning operations. Secondly, the inherent tension between intergovernmental political decisionmaking process and integrated military planning that is natural to any multinational operation was compounded by a mental gap between the UN political staff and the NATO trained military officers from European contributors. This mental gap boiled down to two competing views on how to manage operations. The UN approach was characterised by a much higher level of political sensitivity – with obvious implications for information management e.g. – and a decen tralised approach to operation management. The greater political unity amongst European troop contributors as well as the preference for more robust command structures thus created a structural fault line in the mission set-up early on. Interestingly, the confrontation between both worlds proved to be a learning experience and tensions eased over time. Individual UN staffers came to see that military planning doctrine as standardised by NATO had something to offer in terms of making planning and management processes work smoothly. At the same time, European troop contributors rediscovered UN peacekeeping ten years after leaving it and found it could be made to work better than it had in the past. Thirdly, peacekeeping in a context such as Lebanon after the 2006 war is fraught with conceptual problems when it comes to operational planning doctrine. The UN’s approach to operations, which is procedurally flexible but chronically under-resourced, is very light on the content of operational planning. There is no real peacekeeping doctrine spelling out the causal reasoning how the ambitious goals set out in the mandate can be achieved. Peacekeeping thus relies on a more programmatic approach to planning operations, bringing about conditions that hopefully lead in the right direction. If such hopes prove to be idle, the operation simply goes on in time and becomes part of the scenery. The NATO planning doctrine preferred by European troop contributors does give planners the conceptual toolkit for designing operations, but this conceptual toolkit is only fully applicable to missions with powerful political mandates. Traditional planning concepts such as centre of gravity and end-state remain useful as an intellectual compass, but in a peacekeeping context they lead planners to think far beyond their mandate. What can be made of the strategic effectiveness of the enhanced UNIFIL? 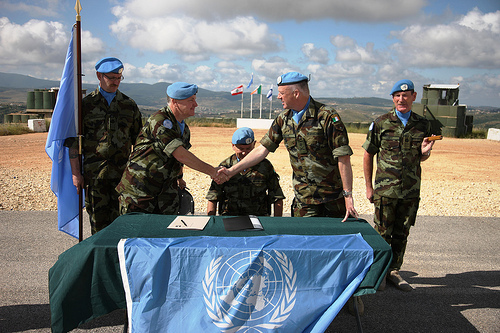 The most straightforward effect was that the enhanced UNIFIL made the ceasefire on 14 August 2006 possible in the first place and contributed to maintaining it ever since. The three-dimensional strategic role outlined in this paper does give a coherent answer to how the operation can foster the intended effects. The enhanced UNIFIL in this sense does harness the use of armed forces for political ends. Yet it is equally true that such a strategy cannot achieve conflict resolution – it can only enable the sort of conditions that make renewed hostilities less likely. An operation with a limited political mandate can only achieve limited objectives. In that sense, the enhanced UNIFIL cannot be strategically decisive: it manages conflict on an interim basis, but does not make peace.